All foreigners in Japan have ‘a gaijin card’. I don’t mean the official ‘alien registration card’, which is issued by the government and is confusingly also sometimes referred to as ‘gaijin card’. I mean the imaginary gaijin card that allows us foreigners to do things that we’re actually not supposed to do. Of course we’re not talking about breaking the law. I mean the small violations that we willingly or unwillingly commit every day. Like crossing the street when there’s a red light but no traffic (which in Europe is quite common). Or talking too loud on the train (unfortunately also quite common in Europe). Somehow when you’re a foreigner, the expectations in terms of following the rules are a little lower. I have to admit that sometimes I take a little advantage of that, which I refer to as ‘using my gaijin card’. 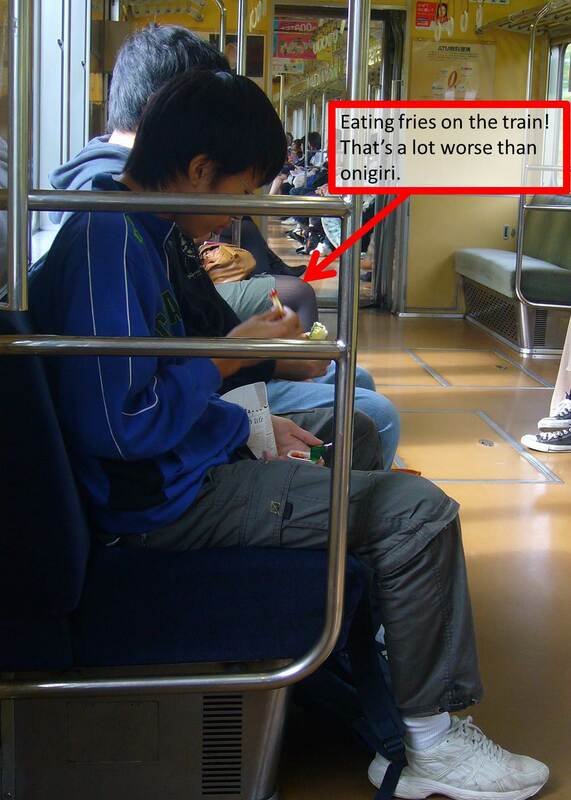 For example: you’re not supposed to eat on the train. But when I’m running late and haven’t had the chance to have breakfast, I occasionally have the audacity to eat an onigiri (rice ball) on the train. In that case I’m ‘using my gaijin card’. The gaijin card automatically grants you membership of ‘the gaijin club’. When you pass other foreigners on the street, a nod and an understanding glance is exchanged. Yes, we’re in the same club. I have to admit that after seeing only dark-haired Japanese people for so many days in a row, I’m quite surprised whenever I run into another foreigner. As I feel more and more at home here, I start to forget how much I stand out myself. This entry was posted in Culture, Japan and tagged Gaijin, Impressions of daily life, Train by Haruko-chan. Bookmark the permalink. Heheh I totally eat on the train if I’m just dying of hunger 🙂 Once, I was late for a wedding party and even did my nails. I’m not proud if it, and I felt really bad, but I was like, sorry しょうがない, it’s for a wedding party! Any other event and I wouldn’t have done it, but for that I just had to. Hehe, I think I will have a hard time stopping bowing too. I caught myself bowing goodbye to a Belgian friend here in Japan yesterday.